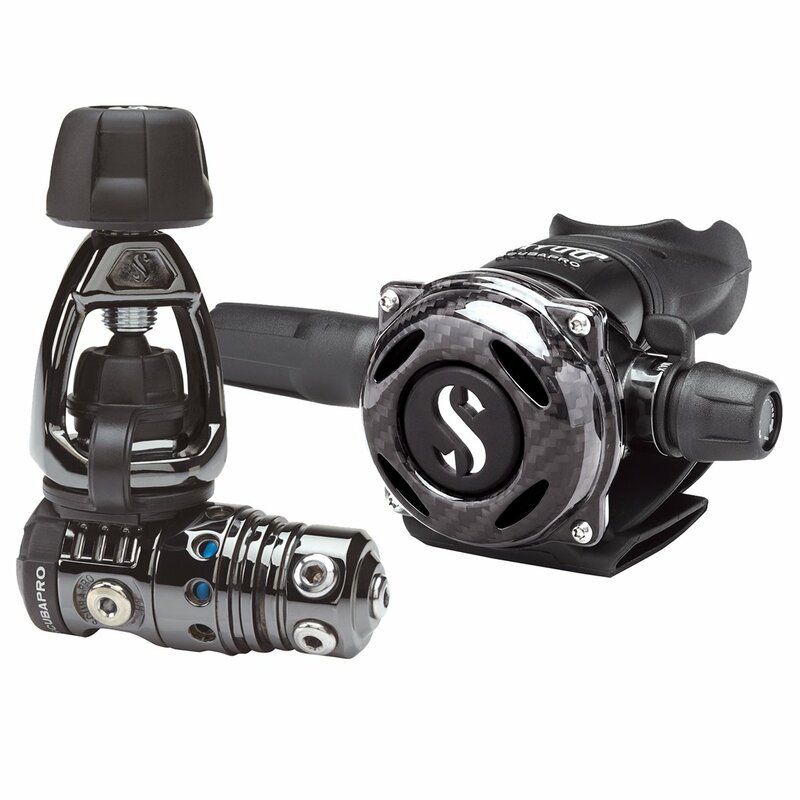 The premium high-performance MK25 EVO/CARBON BLACK TECH is not only the best-breathing reg in SCUBAPRO's line, it's also the leader in advanced design and materials and the toughest in terms of high-tech durability. Like the original A700, the A700 CARBON's casing is full metal to take advantage of the extremely high heat exchange rate that makes this second stage such a great choice for cold-water diving. However, the screw-down front cover, in place of metal, is hand-made out of carbon fiber - the same material you find on aircraft and high-speed race cars. Carbon fiber is extremely lightweight and, unlike metal that can change shape when dropped or struck against a hard object, carbon fiber can resist substantial shocks without damage. Performance-wise, the A700 CARBON retains the same muscular performance as the all-metal A700. Its air-balanced valve technology and oversized exhaust valve work in conjunction with a well designed sectional exhaust tee, a first-rate purge and responsive user controls to create a tech-tough breather with effortless inhalation and an ease of exhalation that is unmatched. It's now just lighter and tougher. Finishing off this premium air delivery system is a DLC (Diamond-Like Carbon) BLACK TECH coating that's applied to both first and second stages. This unique coating not only lends a sleek technical look to the system, its scratch- and corrosion-resistant properties perform an important function in protecting the reg against the strains and stresses of technical diving as well as the ravages of the saltwater environment. Put it all together and you have the MK25 EVO/A700 CARBON BLACK TECH, diving's ultimate muscle reg, built with high-tech materials and sporting race-car-sleek styling. It looks great, is ultra-durable, and delivers the best breathing performance around. Carbon fiber is virtually bulletproof and also extremely lightweight. The A700 Carbon's cover weighs only 10 grams, compared to the 42-gram weight of the original A700's metal cover, resulting in more comfortable diving. Air-balancing smoothes out the inhalation effort when diving at varying depths and supply pressures. Available in either a 3364psi/232bar INT or 4350psi/300bar DIN configurations. DIN version comes with a new dual-compound wheel that features a new ergo shape and soft grip on a rugged black nylon frame.